The idea for brisket jalapeño poppers came to me while sitting at an airport bar, waiting for a flight to Cozumel. My friends and I split an order of jalapeño poppers and brisket. To wash it down, some ice-cold beer. Then the thought came to me: smoked brisket, jalapeños, cheese – these should all be married together and fried to a golden crunchiness. We’ve since served these at countless events. It just goes to show you never to discount great inspirations while sitting at an airport bar. Heat oil in deep fryer to 350 degrees. In large mixing bowl, combine brisket and egg and mix well. Add jalapeño, dry rub mix, and barbecue sauce. Mix well. Add breadcrumbs in small amounts and make sure they are evenly distributed. Add cheeses and mix well. Scoop ½-ounce spoonfuls of mix to form poppers. Fry in oil until golden brown. Remove and drain on paper towel. Yields about 20 poppers. Heat a 12-inch skillet on medium. Drizzle olive oil in pan and add a dash of kosher salt and 1 to 2 cracks of fresh pepper. Spread barbecue sauce on bread slices. Sprinkle half the cheese over two slices. Place half the brisket on top of the cheese. Add greens and top with the remaining cheese. Top each with a bread slice, pressing down gently to set. Place sandwiches in skillet. Cook until crisp and deep golden brown, 5 to 10 minutes per side, flipping sandwiches back to first side to reheat and crisp, about 15 second. Watch sandwiches carefully, checking often to avoid scorching. Serve immediately. Serves 2. Variation: You can use our Spicy sauce if you like a sandwich with a little kick. The Salt Lick Barbecue Sauce. 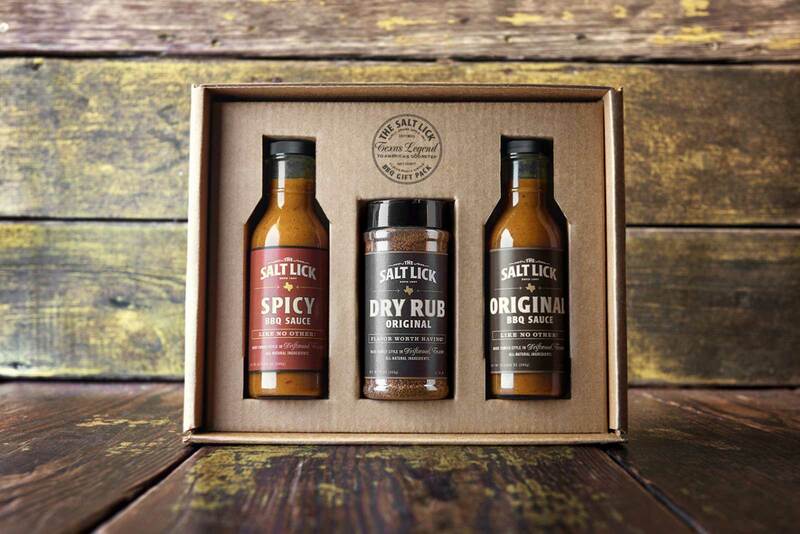 The Salt Lick Barbecue Sauce is the one ingredient we use from start to finish with our food. We use it before we start to cook meats, we use it to baste while we’re cooking, and we serve it at every table as the perfect condiment for your meal. We even included it in a few of our side dishes as well. Long before we started to bottle and sell it, people would stop by the restaurant and request a to-go sampler of it. Now we sell it at the restaurant, in stores, and online. 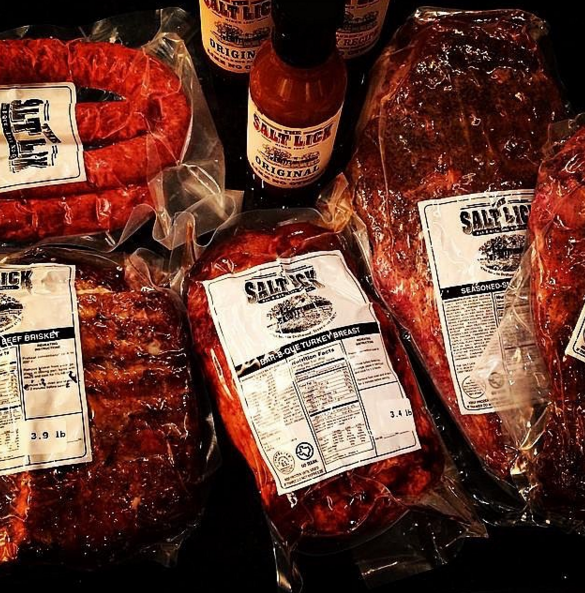 I’ve had people tell me that when they can’t get Salt Lick barbecue, they’ll at least use their home stash of our sauce to doctor up barbecue from somewhere else. We use a vinegar-based sauce rather than a tomato-based sauce, which would burn and add an acrid taste to the barbecue. Ours is essentially a Southeastern style of sauce that has been Texa-fied with a list of ingredients – cayenne and chili powder, to name a few. When the roots of this sauce left the Carolinas with my relatives in the 1870s, I am sure it had no cayenne pepper in it. But over the years it has taken on more of the terroir from which it is served. What is the mail order phone number? For assistance or to place your order over the phone, please call our mail order department at 512-829-5295.